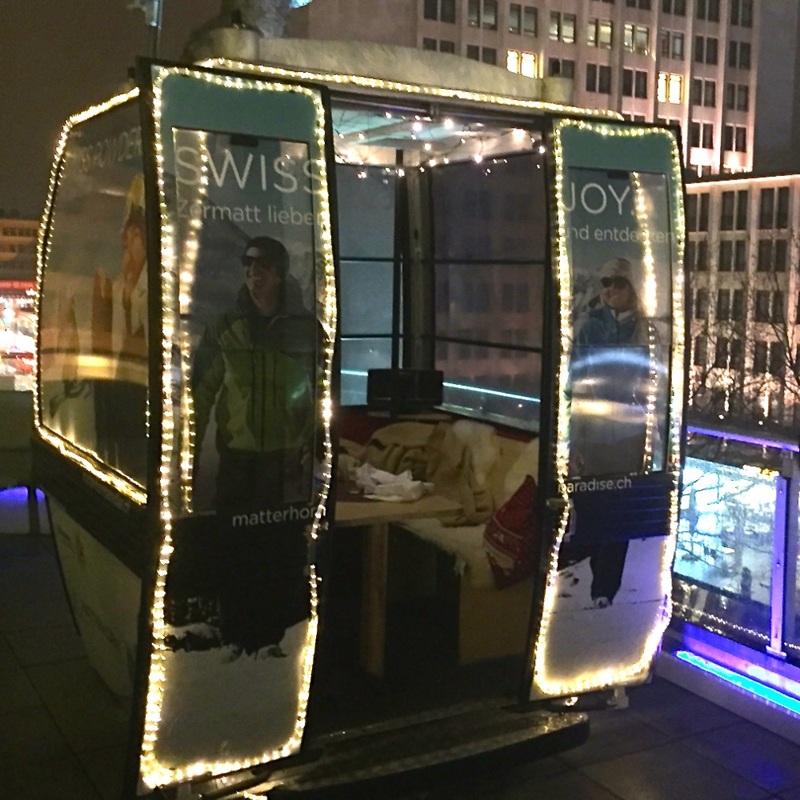 I have been meaning to visit the gondola on the terrace of Swissôtel's Restaurant 44. Once used to ascend the Matterhorn in Austria, this basket is now spending its third winter season watching over Kurfürstendamm, available for smaller group gatherings over cheese fondue or other Swiss delicacies. As popular as this place is, however, getting a reservation is not as easy as you might think. But the day arrived. The way leads us onto the first floor, through the restaurant towards the terrace – where we reach our final destination after only a few steps. The joyous waiter closes the door and we start getting comfortable. It is cold and rainy outside while we are covered in Swiss Army blankets, sitting on lambskin at an old wooden table inside. Gentle tunes. Soft lights. In spite of a small radiator, it is still somewhat crisp inside – you'll be well-advised to bring along a warm jacket. This, however, makes the whole experience all the more authentic. We go through the menu: eight fondues to choose from, all of which Swiss head chef André Egger has composed himself. Among them, illustrious compositions such as “tangy-fruity” with cheddar, butter cheese, pungent Stilton, perfected with a dash of port wine. Nut bread, celery and pear are for dipping. Or the 'delicate-aromatic' combination with three kinds of goat cheese, refined with sparkling wine. Served along are a zesty French country bread, figs and roasted apple wedges, as well as honey or maple syrup. Our small group – the gondola only takes up to four people – chooses to go with the 'herbal-aromatic' fondue, based on Gruyère and Appenzeller, refined with basil, parsley, lemon thyme, green pepper and grappa. Cauliflower, broccoli, sweet pepper, mushrooms and light bread are served along. 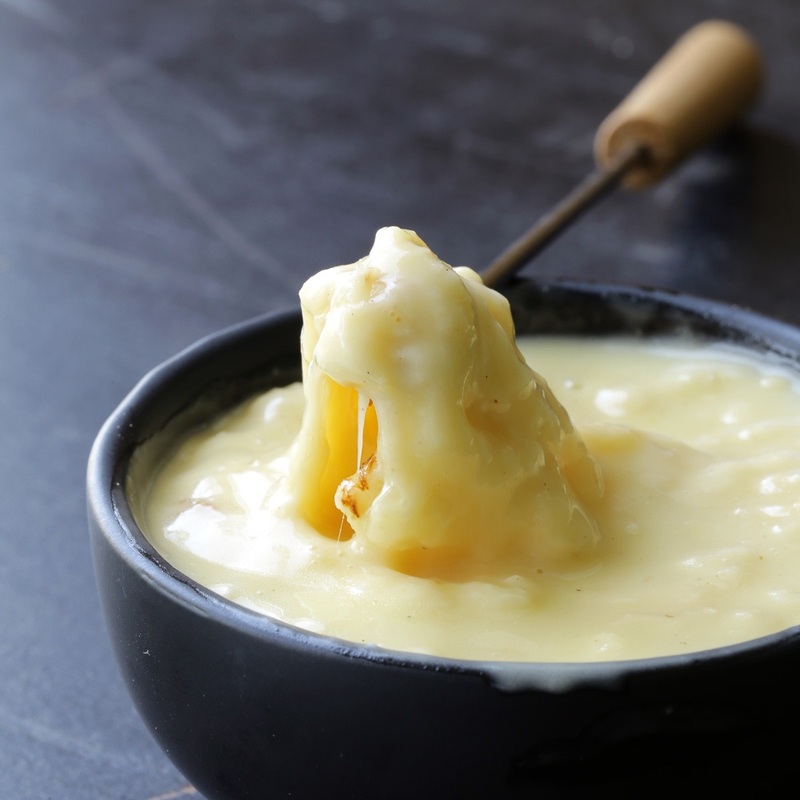 It's a shame to admit that I had never before tried cheese fondue and I was surprised to discover how this Swiss national dish was much lighter than I had feared. Almost all of the bread is left over, but the vegetables, dipped in this tangy cream of cheese, vanish piece by piece. What a lovely evening! The food was absolutely satisfying and the atmosphere definitely did its share. Every now and then, as we later found out, celebrities find their way to this place as well. Which comes as no surprise, seeing how you couldn't be anymore intimate and unobserved in public than right here. The only thing missing to complete the scene are ski suits. But I will make sure to demand this be the dress code for next time.